Just finished another article this week. Alien/Predator Parodies in other tv shows. Sure, there’s probably a million of them but I’ve only included ones that I’ve seen for myself so I’m sure the page will get updated over time. I’ve also uploaded video clips of all the animated parodies on that page too. Be sure to download The Simpsons Clip where Groundskeeper Willie goes into the airvents after Santa’s Little Helper. 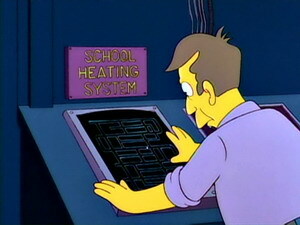 Then Principal Skinner is watching on this motion detector monitor. Direct parody of when Dallas goes into the airvents in Alien. I thought it was very funny. Cool page, a few of those are oldies but goldies. I remember another animaniacs episode where the animaniacs are in trouble, and they say "we could be an endangered species", and then the camera pans to Arnold Schwarzenegger being pinned up to a tree by a Predator and saying "endangered species!?!?!?!?. Pretty funny. Really? You don't remember the name of the episode, do you? None of the videos seem to work. I hear sound, but no video Is it maybe due to the encoding ? They were all encoded in Xvid. You need to have the right codecs. Xvid, like Divx, is pretty popular. Alternatively, just download K Lite Mega Codec Pack, which can play everything. There was one on the new series of Doctor Who. They're going through a collection of alien artifacts, and in the background you can see an Alien egg. Forgot the episode, but I'm fairly damned sure it's the one where they discovered the chained-up Dalek. Found the episode - Episode six of the season with Christpher Eccleston, 'Dalek'. They're looking around in a guy's private collection, and an Alien Egg is visible in a display case. Can't find an image. My favorite parody was from “Johnny Bravo”, he wakes up in a Xenomorph hive and an egg opens up in front of him, he giggles sheepishly and the screen goes black and it says The End. I'll ask around with some people from the RVB forums, I know it was animaniacs though. I can remember an episode of 'Animaniacs' where ther was an WB party, and you see a lot of tables where a lot of movie characters where sitting. and on one table where ripley sitting near by an alien and they where fighting about something like married people. pretty funny but i dont know whitch episode it was and i cant find it. Page created in 0.07 seconds with 30 queries.